2018 Suzuki KingQuad 750AXi Power Steering Special Edition The King Of The KingQuads Just Got Tougher Building on the already outstanding KingQuad 750AXi, we made the Special Edition the ultimate machine for work and play! 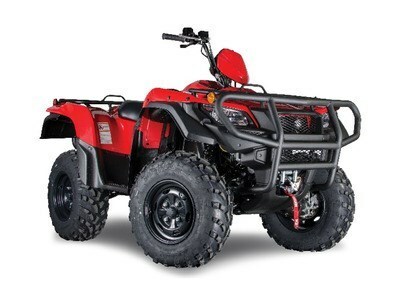 The KingQuad 750AXi SE features a powerful WARN winch and heavy gauge front and rear bumpers protecting you and your machine. Incorporated in the rear bumper is a heavy duty 2" receiver hitch adding to its versatility and utility. In order to protect you from the harshest elements Canada can throw at you we added wide mud guards front and rear. Lead the pack with the Canada unique KingQuad 750AXi Special Edition. Features may include: ENGINE 722cc liquid-cooled DOHC 4-valve fuel-injected engine tuned to deliver a mighty low-to-mid range torque along with a powerful high-rpm output. Lightweight aluminum cylinder bore is electro-plated with Suzuki's own race proven SCEM (Suzuki Composite Electrochemical Material) for improved heat transfer and tighter piston clearance. Cylinder canted forward 48 degrees for lower center of gravity, reduced engine height and lower seat height, and is rubber mounted with two balancer shafts for smooth performance. TRANSMISSION QuadMatic™ CVT-type automatic transmission designed for maximum versatility and convenience – fender-mounted gate-type shifter operation for high/low forward ranges, plus neutral and reverse. Compact and lightweight electric power steering, positioned high on the vehicle to help avoid water and debris, delivers lighter steering in a variety of conditions to help reduce rider fatigue. Compact torque-sensing limited-slip front differential offers more powerful traction plus light steering effort. A differential-lock system provides serious four-wheel-drive traction. CHASSIS High-tensile steel frame with special attention given to a balance of rigidity and weight for optimum chassis performance and a comfortable ride. Independent double A-arm front suspension (6.7 inches of wheel travel) includes large diameter shock absorbers with 5-way spring preload adjustment Fully independent, A-arm and I-beam rear suspension with long suspension travel (7.7 inches of wheel travel), includes large diameter shock absorbers with 5-way spring preload adjustment and large diameter rear sway-bar. UTILITY/CONVENIENCE Easy-to-read LCD instrument display – includes speedometer (mile/km selectable), odometer, twin-trip meters, hour meter, clock, fuel gauge, drive range. Distinctively styled 30W multi-reflector halogen headlights, and compact 5/21W tail light and brake light. High output magneto generator system and 18-amp maintenance-free battery provides extra power.